For users of LiveLink™ for MATLAB®, COMSOL Multiphysics® software version 5.4 brings updated user interfaces for the functions mphnavigator, mphsearch, and mphmodellibrary; improved support for the Join dataset; and a connection for mphlaunch to a graphics server. Browse all LiveLink™ for MATLAB® updates below. 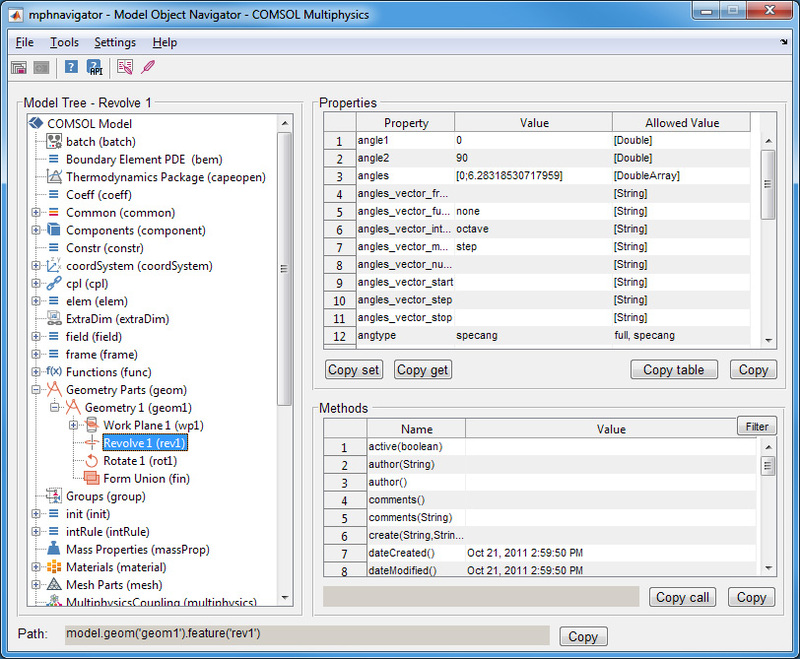 The functions mphnavigator, mphsearch, and mphmodellibrary have been updated with new information and features. Using mphnavigator, you can add reports to existing models and generate the reports themselves. Access to help has been improved by giving direct access to the help resources for the COMSOL API. The menu Tools > Solution opens a table with more information about solutions, datasets, parametric sweeps, and more. This gives a concise overview for advanced models with many studies and advanced solver settings. When selecting Solution nodes (model.sol) or Study nodes (model.study), summary information is shown for the selection node. New plot types are available using mphplot. For example, plots for layered shells and new features for polar plots: start angle, direction, unit, and symmetric angle. The visualization of 3D surfaces is improved in cases where the colors change rapidly over a small portion of the plot. Additionally, the function mphviewselection now has improved graphics for displaying overlapping faces in 2D. Layered slice plot of the second Piola-Kirchhoff stress from the model Thermal Expansion of a Laminated Composite Shell. The COMSOL menu shows the available plots for this model. Layered slice plot of the second Piola-Kirchhoff stress from the model Thermal Expansion of a Laminated Composite Shell. 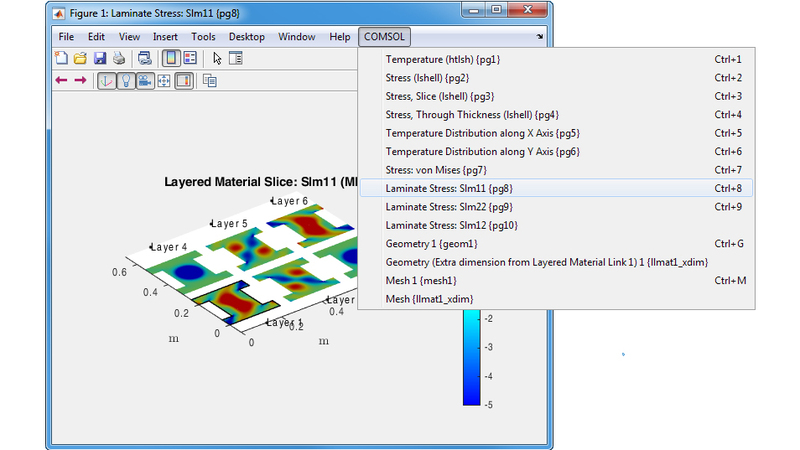 The COMSOL menu shows the available plots for this model.